It is surely the case that Morrisons are the supermarket of choice for the pie lover. It is always a delight to visit the pie counter where the pies are free and unboxed. I would say a normal supermarket is like going to a pie zoo. The pies are cooped up in boxes, people say they are happy but how can you know? More often than not you can't even see the pies themselves. Whereas Morrisons is like a pie safari. The beef and onion is free to terrorises the sausage rolls. The chicken curry proudly displays its golden pastry, glowing under the artificial lights. If you are lucky you might catch a glimpse of the king of the pie counter, the steak and ale, lording it over his fellow pastry products because he knows his line was the best selling last year, is best selling this year and will sell the best again next year. He is just an unstoppable force of nature and awe inspiring to behold. I have recently moved house and the fact that I am now near a Morrisons is not quite the reason I moved here but it certainly adds a little extra joy to life. It is great to visit every week. Sometimes I don't even buy anything from the pie counter but just enjoy window shopping. The guy at the counter perhaps thinks I'm a bit weird as I stand salivating at the pies. My high expectations were perhaps the reason I was a bit disappointed recently. 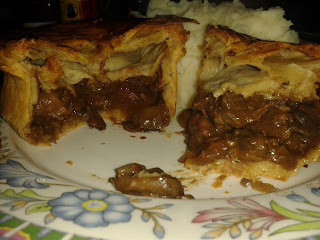 I chose a fantastic looking Steak, Mushroom & Bacon square pie which was puffed up proudly, promising a pie packed with content. However upon cutting it open, I was disappointed to find this was not the case. About half the pie seemed to be empty. This pie was a bit more expensive than most so I would expect better. However it was a fairly big pie so overall it wasn't such bad value. The filling tasted okay although the meat was a bit chewy. 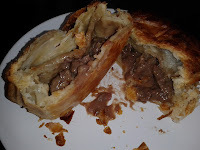 Thankfully the combination of short crust pastry side and puff pastry lid was to a very high standard. 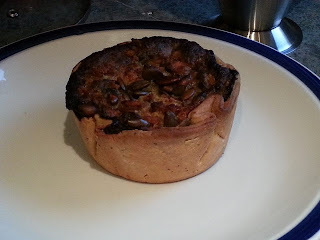 The shortcrust in particular held its shape well but at the same time managed to be lovely and gooey. So overall not a bad effort. I decided to tweet about this pie to Morrisons, indicating that while it wasn't bad it was a bit disappointing. I was surprised that Morrisons took this so seriously, sending me vouchers to get another pie. It is commendable that they are listening to their customers so closely. If only all companies were so good! 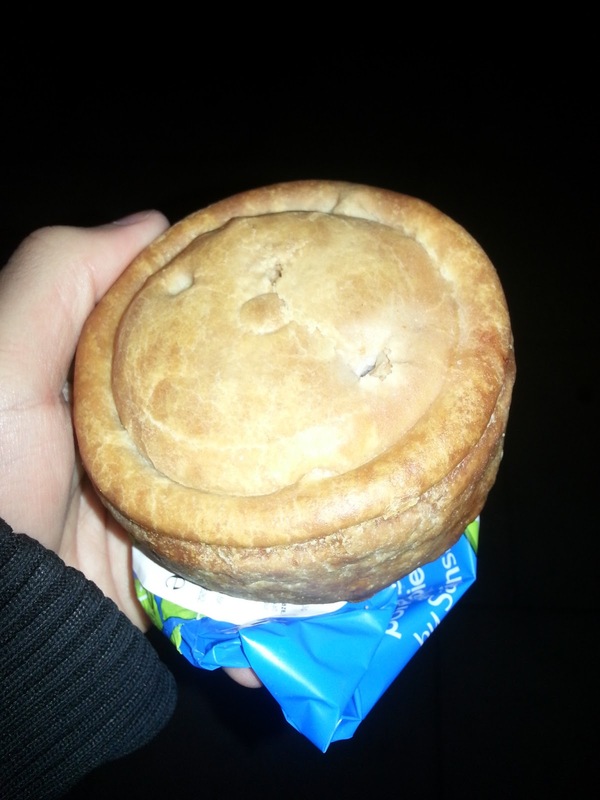 It was by no means a formal complaint, it just shows how seriously Morrisons take their pies. 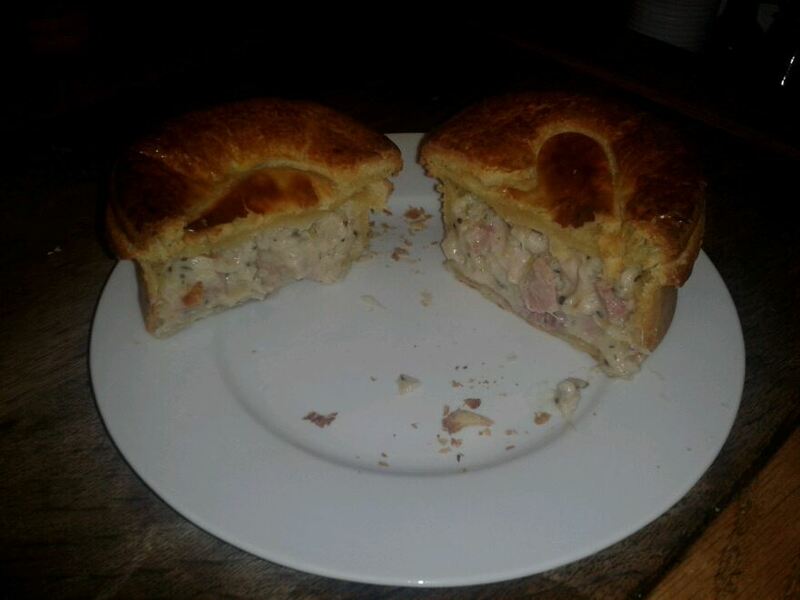 So I tried again with a Chicken, Ham and Leek pie and two rather gourmet looking medium Pork Pies. I still had money left over from the £3 vouchers I was sent after buying these three indicating they were great value. 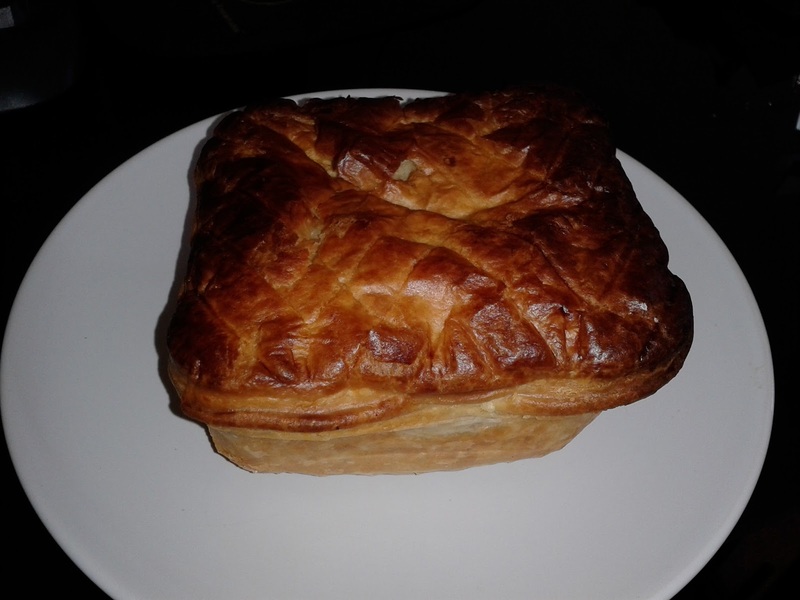 Firstly the Chicken, Ham and Leek pie. 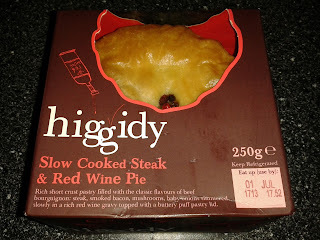 I almost fell off my pie reviewing stool when I got home and saw the pie had been labelled as a 'pasty'! 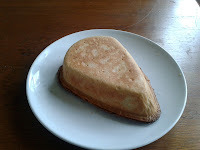 It certainly was not a pasty having well defined sides, base and lid. They really need to be more careful with this very important distinction. It was very stressful for a moment when I thought I had bought a pasty by mistake! Fortunately this was a pie and once I delved in this golden delight it was a return to form for Morrisons. There was a lovely thick sauce oozing out with actual proper chucks of meat. While the capacity of the pie was still big this time it was really packed with content. I felt like I was getting a great value pie experience. 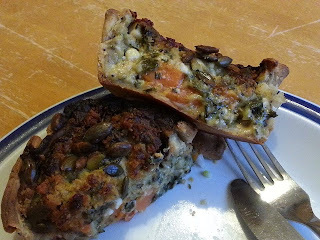 Again the pastry was great; Morrisons certainly know how to mix their flour and fat. This was almost the perfect pie, however it just needed a bit more of a full on flavour, a shame as it did everything else so well. 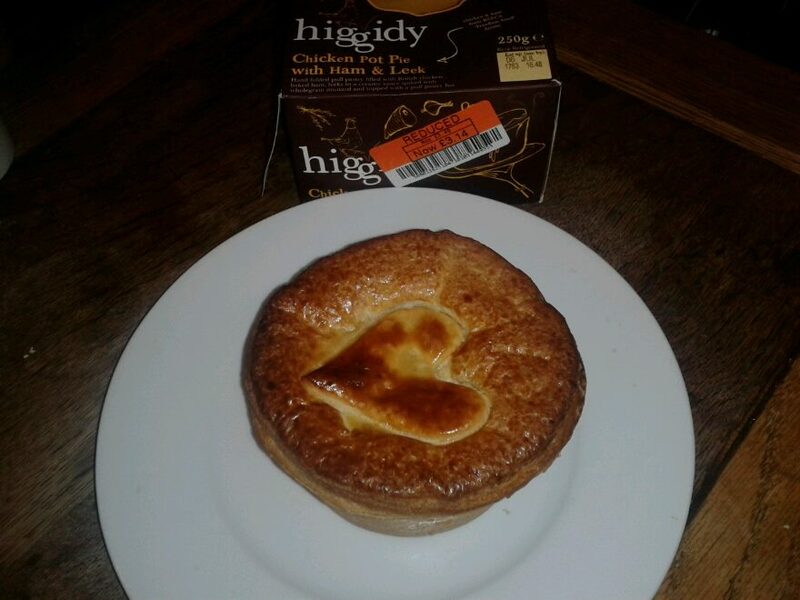 However, for the price this was still one of the best value supermarket pies I have had. 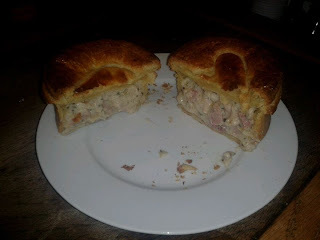 The hand crimped pork pies were also rather special. These weren't like traditional pork pies. You can see from the photos that they had an ergonomic shape which meant they were rather satisfying to hold in the palm of the hand. I spent a while just admiring this pie not wanting to ruin its delicate edges. You might think that it seems like it has too much pastry given that pastry for a pork pie is often rather solid. However the pastry for this pork pie was quite soft and light and the extra pastry was a pleasure to eat. 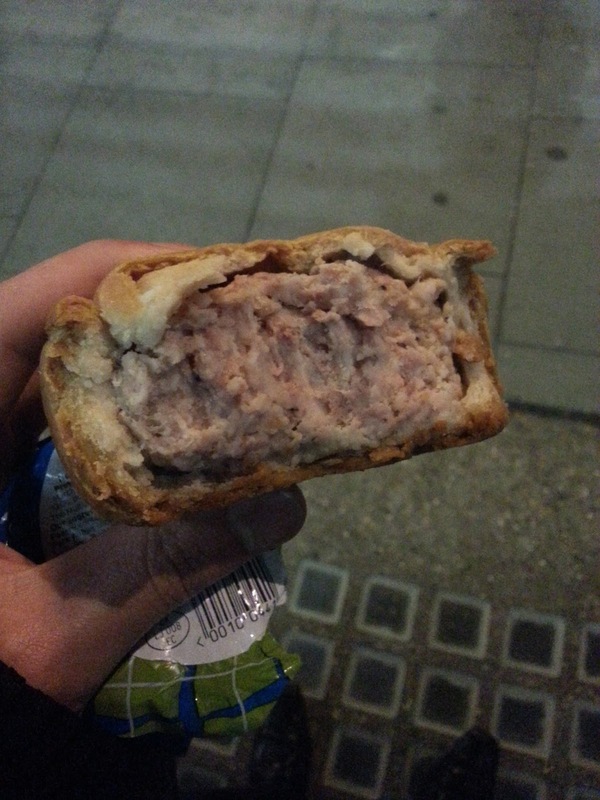 The meat was pink, unlike the grey of a melton mowbray pork pie, and it had a taste somewhat reminiscent of a sausage roll except it had a much more satisfying texture because it wasn't at all mushy. 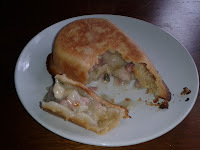 It also lacked the jelly of a traditional pork pie which made it seem much less fatty. Overall it was a lighter, flakier version of a pork pie, but because it still retained wonderful solidness it was perfect for a summer picnic. So, after a slight disappointment Morrisons show their Northern Soul with two fantastic pies. It is great that we can still rely on the only supermarket with a pie counter. However, Morrison are not the only ones to have a pie counter. 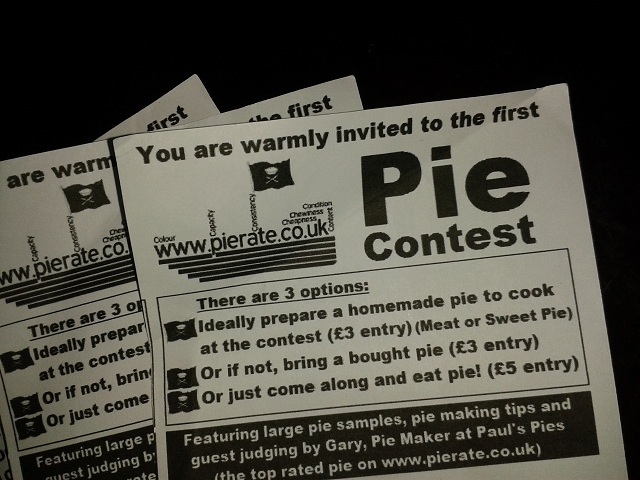 The Pierateers also have a pie 'counter' which has just ticked over 200 pies reviewed. We can count on more Morrisons pies to get us to 300.
continue reading "Count On Morissons For More Pies"
...and then you eat the pork pie. Well let me draw your attention to the first image again. 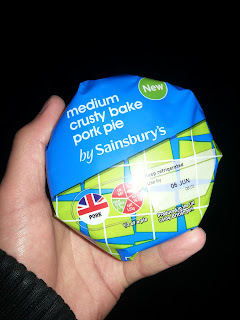 This is a new Sainsbury's "medium crusty bake pork pie". It's the nature of the pastry that is the main draw here. Note in the final image just how thick and crusty this pastry is, especially round the sides of the pie. Aside from apparently being incredibly calorific (the red wheel of death informs me that there are 561 calories in just half a pie), the meat isn't anything special and the jelly is rather absent. What sells it for me though is the thick crusty pastry. continue reading "Grabbing a Sainsbury's pork pie for the journey home"
continue reading "Who will eat all the pies?" continue reading "200 Pie Reviews – A Higgidy celebration"